President Obama on Thursday signed an executive order launching a White House Initiative on Educational Excellence for African-Americans, to be housed in the Education Department. The election-year move was welcomed by leaders in the black community but criticized by conservative groups. To help remedy such disparities, the initiative, consisting of an executive director, a President's Advisory Commission on Educational Excellence for African-Americans and an interagency working group, will aim for “increasing general understanding of the causes of the educational challenges faced by African-American students” and identifying evidence-based practices to improve education outcomes from preschool through college. 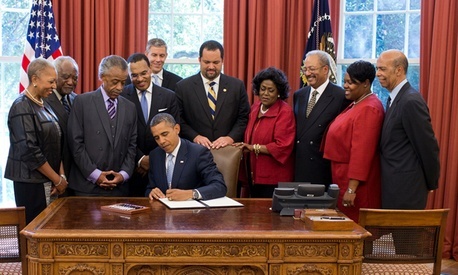 It will complement and reinforce past executive orders promoting historically black colleges and universities. Obama has named Freeman Hrabowski, president of the University of Maryland, Baltimore County, chairman of the new commission. Clegg said the executive order is “silent on the main reason for racial disparities in educational outcomes,” which he attributes to a high percentage of blacks born out of wedlock. That later leads, he said, to disproportionate behavioral problems in schools and greater tendency to commit crimes.